He composes music that is energetic and expressive. Focussing fully on an instrument, he uses a large range of modes of play (Drei Schattentänze for clarinet, 2013, commissioned by the Beijing International Music Competition) and pushes back the limits of virtuosity (Ad absurdum for trumpet and small orchestra, 2002). His compositions are often the result of an intellectual dialogue with works of the past (Mozart, Beethoven, Schubert, Schumann, Mahler, etc.) from which he borrows an element that may be poetic, formal, rhythmic or instrumental (Jagdquartett, 2003, first performed by the Arditti Quartet; Lied for orchestra, 2003; Con brio for orchestra, 2008). 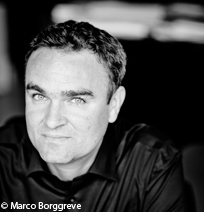 A composer of solo music, chamber music, ensemble and orchestral works, he has also distinguished himself in vocal music, opera and music theatre: Das Gesicht im Spiegel (2003); Am Anfang (2009), commissioned by Bastille Opera for a show by the visual artiste Anselm Kiefer, in which Jörg Widmann intervenes as composer, clarinetist and conductor; Babylon (2012), an opera first staged in Munich by the orchestra of the Bayerische Staatsoper conducted by Kent Nagano.